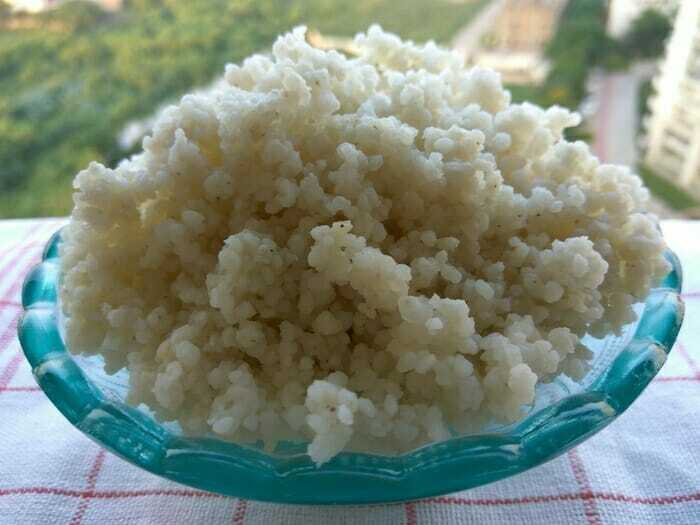 Many of my friends find it difficult to cook perfect millet rice. They face problems like under cooked, over cooked or cooked but the rice becoming dry after sometime. 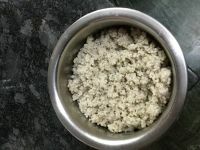 So wanted to share the basic millet rice recipe. Millets like Kodo, Little, Barnyard and Foxtail are used for making rice. In a 2 Ltr Pressure Cooker, soak the millet in 2 cups of water for an hour. Open after pressure settles down. Fluff up after 10 minutes with a fork. Perfectly cooked soft non mushy rice ready. Is it necessary to use only two litre cooker to make rice. I have only a 5 litre pan. Can I make the rice in a vessel which is kept in the cooker. If you have only 5 ltr pan, then cook millet using a small vessel keeping it inside your pan. This will work for you. I suggest you make flour out if ragi . It can be used to make porridge, morkali, dosa, khandvi , halwa etc. I have shared the recipes of the dishes mentioned above. Thanks for your visit. No need. Send the grain as it is. You can send the grains to mill to get fine flour. Grinding at home gives only coarse powder. thanks for your reply. much appreciated. For 1/2 cup foxtail millet, will 1.5 cups water work, keeping rest of the things same? 1 cup millet is too much for one meal when cooking for a single person…any help would be appreciated. For 1/2 cup of millet, 1 cup water will be enough for a grainy texture. If you want mushy consistency, add 1/4 cup more. Thanks for your visit. Thanks for the prompt reply! Appreciate it. And you have a fantastic site! I love your opos book too, purchased it a while back. Thanks so much for your kind words and the book support. Amazing.. I am slowly learning opos and the millet rice is just too perfect. Thank you for your hard work and research. Thanks so much for your visit. Please try the recipes one by one and share your experience. Glad to know that your millet rice came out well. Thanks for sharing your experience. Cook for 3 whistles on small burner high. Thanks for your visit. Mam cooked Kodo Millet. Followed ur instructions to the T. Perfectly cooked grainy Milket rice ready. Saved it for trying you Peanut millet rice. ???? Happy to know that your Kodo Millet Rice was perfect! Happy for you! Thanks for trying and happy to know that you got perfectly cooked foxtail millet rice. Do try other recipes posted here and share your experience. Love it. Especially cooking the millets perfectly.